It's easy to see why Mozart's final opera is one of the most popular in the repertoire—it has a little something for everyone: an enchanting story for the younger set, fabulous arias for the aficionados, a love story for the romantics, and complex symbology for the intelligentsia. While Opera Colorado's current production, stage directed by Kevin Newbury, mines many of these elements, missed opportunities abound, and the overall effect is a throwback to an out-of-date presentational style that is lacking in drama and passion. From the first scene, where the dragon makes an all too brief appearance and is killed off stage, to the excruciatingly static initiation ceremony, we repeatedly wallow in cognitive dissonance between Maurice Sendak's playful sets, exquisitely lit by D.M. Wood, and the generally stodgy blocking of the performance. But when the action is in consonance with the setting, there are shining moments. 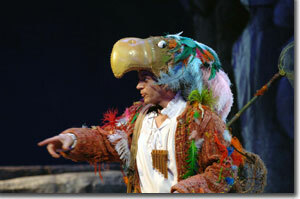 Mel Ulrich's spirited Papageno is a constant delight, boasting and preening like a plumed avian in "Der Vogelfänger bin ich ja ("The birdcatcher am I"). His duet, "Papageno! 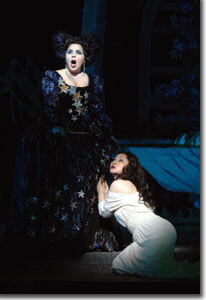 Papagena!," with Mary Ellen Assue (Popagena) is a crowd pleaser. Early on, Amanda Pabyan's Queen of the Night draws our sympathy (and some laughs with her suggestive placement of Tamino's head) during her soaring coloratura in "O zittre nicht, mein lieber Sohn" ("Oh, tremble not, my beloved son"), then strikes fear in our hearts with a fiery "Der Hölle Rache kocht in meinem Herzen" ("Vengeance of Hell stirs within my heart"). Ying Huang's luscious soprano matches her endearing performance as Pamina, more than convincing us of her love for Tamino and breaking our heart when she feels jilted in "Ach, ich fühl's, es ist verschwunden" ("Ah, I feel it, it is gone"). We have great hopes for Norman Reinhardt's Tamino in his heartfelt "Dies Bildnis ist bezaubernd schön" ("This image is magically beautiful"), when he falls in love with Pamina's picture, but we never see this in his body language. Vitalij Kowaljow brings impressive gravity to Sarastro, the high priest, and to the rituals through which the gods bestow their love and wisdom, in his rendition of "In diesen heil'gen Hallen" ("Within these sacred halls"), unfortunately the pomp and circumstance surrounding him doesn't measure up. The seconds for the bellicose Queen of the Night—Kristin Clayton, Jennifer DeDominici, and Judith Christin—provide just the right touch of comic relief and soprano delight, while alternating trios of trebles from the Colorado Children's Chorale bring ethereal enchantment as spirits in the service of Sarastro, as they drift in and out in their magical hot air balloon. Though lacking in dynamic movement, the Opera Colorado Chorus provides plenty of vocal muscle and Dean Williamson and the Colorado Symphony Orchestra deliver a lush rendition of Mozart's exquisite score. This was our first experience listening from the back of the main level. We found the mix well-balanced, though occasionally lacking in volume. Still problematic though is the Figaro Title System. While it is a vast improvement over the old technology, its mounting cuts across the backs of the seating, forcing one's shoulders forward, making for the most uncomfortable experience in the DPAC. The whole apparatus ought to be adjusted back about two inches. 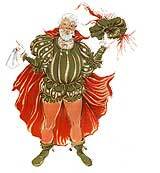 Opera Colorado's production of The Magic Flute has five more performances, November 14th, 16th, 17th, 18th, and 19th. 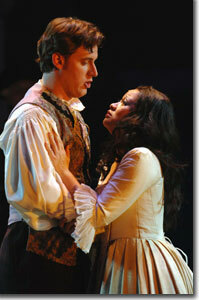 Call Ticketmaster at 303-357-ARTS or visit www.operacolorado.org.